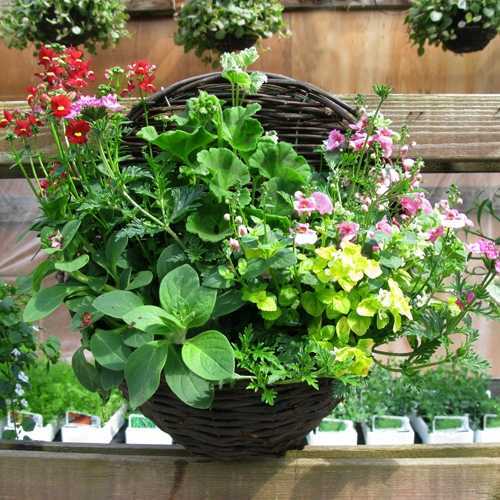 Hanging Half Moon wicker baskets consisting of a range of summer basket plants including Geraniums, Fuschias, Bizzie Lizzie, Petunias and a range of trailing plants. When caring for your planted hanging basket, you need to ensure that it does not dry out. 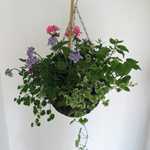 Containers, such as hanging baskets can drain and dry very rapidly especially in hot temperatures. Dead-head the bedding plants often to encourage new blooms. Baskets may differ slightly from the image shown. 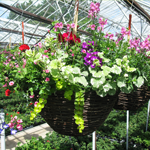 All baskets are planted in store with beautiful, seasonal bedding plants. If you have any requests please put them in the delivery instructions.